Hello again! 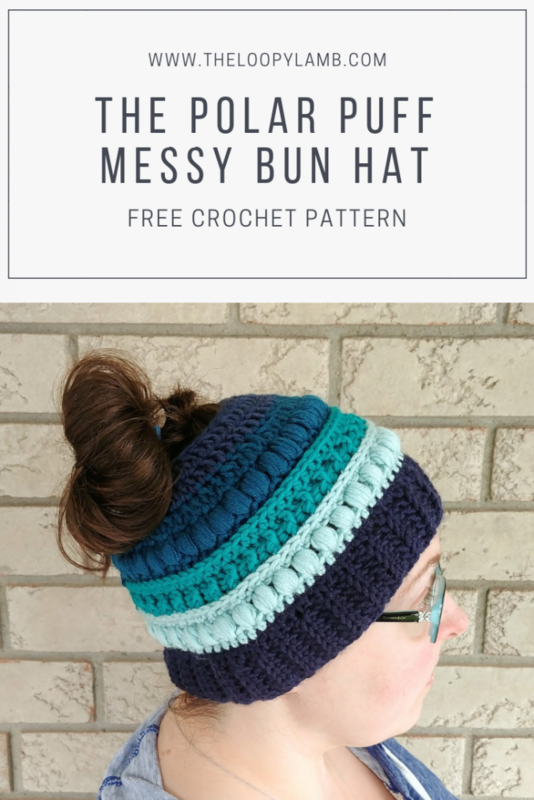 I’m back this week with another free crochet hat pattern – the Polar Puff Messy Bun Hat. 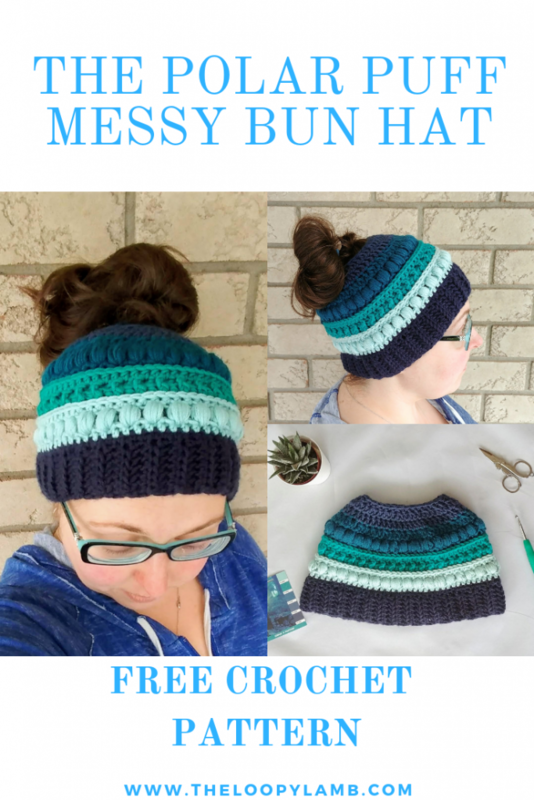 This hat was created when I received a custom order for a messy bun hat with loads of texture. The client had seen my post on Instagram for my Ava Cowl and loved the puff stitches. 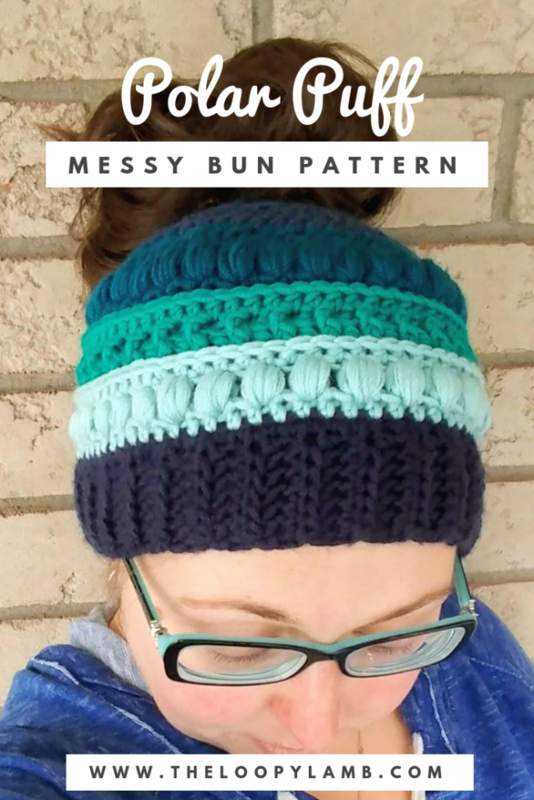 She wanted a messy bun hat that was warm and had a ton of texture so I wanted to make sure I included a few different textures to give the hat some variety. After discussing materials, we agreed that I would use the Caron X Pantone yarn for her hat. I knew exactly what I wanted to make her and set out to making it happen. After playing around with some designs, the Polar Puff Messy Bun Hat was born. This pattern works up quickly and is good for a beginner that wants to try a few different types of stitches in a single, small project. 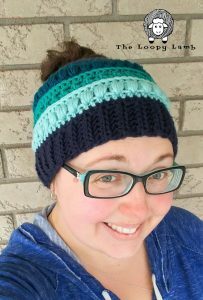 Like my Arctic Gem Beanie, this pattern features a ribbed band, made with half double crochet done in the back loops only. The pattern calls for 2 skeins of Caron x Pantone yarn however, you will not use all of the second skein. You will likely have enough to make a pair of gloves to match your new hat. An ad-free version of this pattern can be purchase HERE for a small fee. Puff Stitch: Yarn over (YO) and insert hook into designated stitch. YO and draw through stitch and pull up to height of previous stitch (or chain). YO and insert hook into same stitch, YO and pull through stitch and make it the same height as previous stitch 4 more times. YO and pull through all loops on hook. CH1 to secure. Finished size: 6.5 inches tall x 10 inches wide. 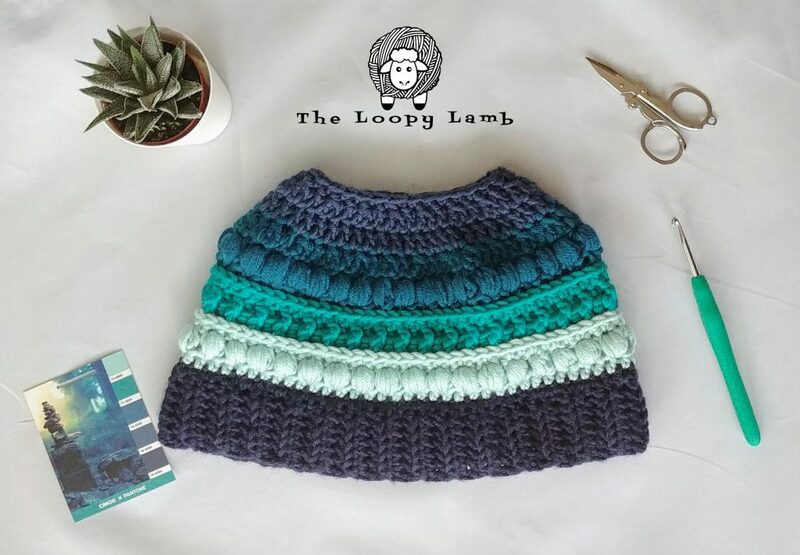 • After the brim is completed, the body of the hat is worked in the round from the bottom up. The end of each round is joined with a sl st.
• Instructions within the ** are to be repeated. 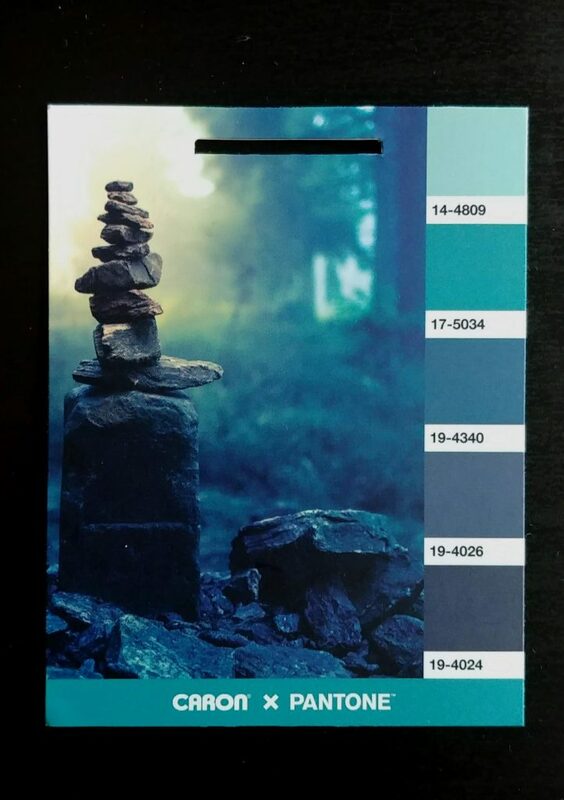 • I’ve used the Pantone numbers on the packaging to note which colour is used and my description of the colour next to the Pantone number for those that may no longer have the packaging. A picture of the tag is included here as reference. Repeat row two until your band is approximately 18.5” long. You can make the band a little shorter or longer than that if you need to. Generally, a good length for a band for an adult is between 18” – 19”: long when laid flat. Do not stretch. When completed, fold the band in half and sl st the two sides together. Turn the piece so the seam is on the inside and the right side is facing you. If you liked this pattern, please pin it and share it. If you want to receive an email when I post new content, please subscribe to my email list (check on the right sidebar if you want to subscribe). As always, if you’ve got a question or a comment, I want to hear from you. Drop me a comment below. I’d love to see your finished items! Please share your finished makes by tagging the pattern on Ravelry, sharing it to our Facebook page or Instagram! Use #theloopylamb to share on Instagram for a chance to be featured on my Instagram page.